The signature dance of the gigolo, as depicted in a selection of old movies. A nice review of what a polished Tango looked like in the '30s and '40s. Tangos From The 1933 Argentine Film "TANGO!" Part of my dance-in-old-films project: I've extracted the numerous Tango scenes from the 1933 Argentine film "TANGO!". Please forgive the lousy sound. I contemplated replacing it with a nice recording, but then concluded that its value as a historical artifact is enhanced by hearing the music to which they are dancing, even if it is muddy and tinny. French folks dancing the Foxtrot (aka One Step) in an outdoor cafe from the 1931 film "Tout ca ne vaut pas l'amour "
A selection of clips from 1920s and 30s movies illustrating the simplicity, romanticism and sensuality of the Tango of the Jazz Age. Includes clips from "Die Buchse der Pandora", "Her Majesty, Love", "Abwege" and "Prix de Beaute". This video, made up of Fox Movietone News rough footage from 1930, shows in great detail, ordinary folks dancing the Fox Trot in 1930. This video is from a collection of raw footage and out takes from Fox Movietone News. I cut it down to the dance related bits from the footage I found on the University of South Carolina website. From 1930, at the Poinciana Breakers Casino in Palm Beach Florida, ordinary folks dancing the Fox Trot in the sort of general public dancing that used to be found everywhere. 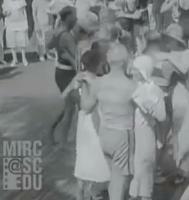 Video Pastiche: Random Bits of Happy Dancing from the 1930s.